Despite the simplicity of this kit, it's a very accurate representation of the factory team racer as it was entered in the Japanese GT championship. Body shape is the best of all Rx-7 racers I have seen sofar, wheels are accurate and the decals offer authentic markings for a japanese factory team car. The kit has been around in various guises, with or without an electric motor included. There is also a street version of this kit. In July 1999 this kit was re-released in IMAI's Super Silhouette Series. No electric motor is included this time, the rest of the kit is still the same quality, including the very nice decal sheet. 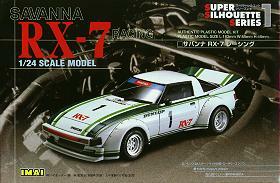 After IMAI went bankrupt in February 2002, Aoshima acquired a lot of IMAI tooling, including this RX-7 racer kit. 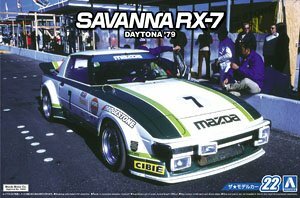 Aoshima has made some improvements to the kit and best of all, included a comprehensive decal sheet for the Mazda factory Rx-7 Number 7 that won GTU class on its debut in the 1979 Daytona 24hr race, a great way to commemorate the 25th anniversary of this landmark win. Driven by Y.Katayama, Y.Terada and K.Yorino, Number 7 finished an impressive 5th overall. Some new parts were added to existing trees, these consist of a set of four high beam lights, sleeves for the rear axle and a new fuel filler cap. Aoshima also replaced the windshield wipers with very nice looking new ones. Body, interior parts and chassis parts are all molded in white. The wheels, rear view mirror and fuel filler caps are satin aluminum plated. The only traces left of the electric motor and light bulbs are the battery compartiment in the chassis and the head lights that can still be raised and lowered. 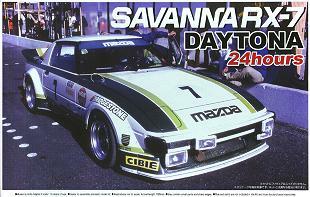 The box art shows an actual photograph of the Number 7 being prepared for the race in the pit lane of the Daytona race track. Do note that the fender flares in the kit are slightly wider (3mm overall, 1.5mm on each side) than those on the actual car. The decal sheet contains all markings and all of the green striping for the Number 7 scheme, including lots of small decals to cover awkward corners, intakes, etc. Detailed placement instructions are given in both japanese and english. This is a reboxed version of the Daytona winning RX-7. Only changes are revised box art and a slightly revised instruction sheet. Apart from a new kit number in the lower righthand corner and some small items that have been shuffled around, the beautiful decal sheet was not changed. The parts trees, including the rear spoiler, are now molded in black, the body is molded in white. The wheels, rear view mirror and fuel filler caps are satin aluminum plated. 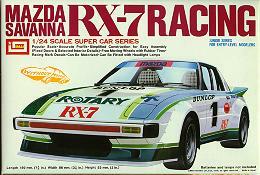 This kit depicts the second Mazda works Rx-7 that was entered at the 1979 Daytona 24 hours race, it was driven by Walt Bohren, Jim Downing and Roger Mandeville and finished 2nd in GTU class, 6th overall. Body is molded in white. The wheels, rear view mirror and fuel filler caps are satin aluminum plated. 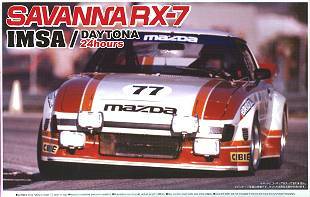 The box art shows an actual photograph of the Number 77 in action on the Daytona race track. The decal sheet contains all markings and all of the red/orange striping for the Number 77 scheme, including lots of small decals to cover awkward corners, intakes, etc. Note the typo in Walt Bohrens name which reads 'BOWREN' on the decals. Detailed placement instructions are given in both japanese and english.